When your specialist talks about poor quality eggs they are usually referring to the condition of the chromosomal or mitochondrial DNA. In women in their late thirties or beyond, this tends to show the effects of many years of accumulated damage. Small defects in the chromosomal DNA can lead to an increased chance of producing an unviable embryo with abnormal chromosomes. Defects in the mitochondrial DNA can lead to inadequate metabolic energy, which might compromise the survival and growth of the embryo in its first few days. There is little acupuncture can do in the case of DNA damage related to age. However, we do know that acupuncture increases blood flow to the ovaries, thereby enhancing nourishment of the developing follicle and appears to increase responsiveness to IVF drugs. There is some evidence that mitochondrial function can be improved with antioxidants and Chinese herbs. In terms of enhancing ovarian responsiveness (or recovery and resilience after repeated IVF cycles) you might like to consider embarking on a more comprehensive treatment programme before your next IVF cycle which includes traditional Chinese medicine diagnosis with the use of acupuncture, chinese herbs and relevant lifestyle changes. Possibly. One group of researchers found that it was the IVF poor responders who gained the greatest benefit from the acupuncture administered in the month before egg collection (reference). To date there have been no studies investigating acupuncture and the incidence of ovarian hyperstimulation syndrome (OHSS). 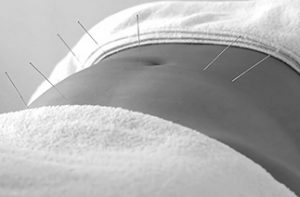 However it is the experience of most patients who have acupuncture regularly during the IVF cycle that they experience less abdominal swelling and discomfort, so it is possible that acupuncture helps to keep excessive follicle growth and ovary swelling under control. This is certainly something that the acupuncture IVF support clinic hopes to gather data on. Once you reach the day of embryo transfer your situation is no different from any other IVF patient’s, so in order to increase chance of successful embryo implantation acupuncture is advised. During the stimulation phase of IVF you may be slightly more at risk of ovarian hyperstimulation. Some women with PCOS produce many eggs but this does not necessarily translate into many viable embryos. If you have had repeated failed cycles of IVF you could consider doing a comprehensive programme of traditional Chinese medicine and lifestyle factors for several months as a preparation for any future cycles or as an alternative to IVF. In terms of acupuncture treatment during your IVF cycle, your case would be treated no differently to anyone else’s. To encourage good response to the IVF drugs and to reduce side effects we would recommend that you have acupuncture in the 4 weeks before egg collection, and then again on the day of embryo transfer. If repeated IVF cycles are not successful then an alternative approach to combating the endometriosis would be a useful thing to try. Chinese medicine, in particular Chinese herbal medicine, has a strong history of effective treatment in this area. Chances are your IVF specialist has told you that you are not the best candidate for IVF but if you decide to try a cycle or two then including acupuncture might make the IVF experience more pleasant and may increase the responsiveness of the ovaries but it is hard to say whether it will lead to an increased likelihood of pregnancy. If IVF fails then one option is to try a longer term strategy with a comprehensive treatment plan over several months. In some, but not all cases of low ovarian reserve and high FSH good results can be achieved with such an approach which includes acupuncture, Chinese herbs and lifestyle changes.